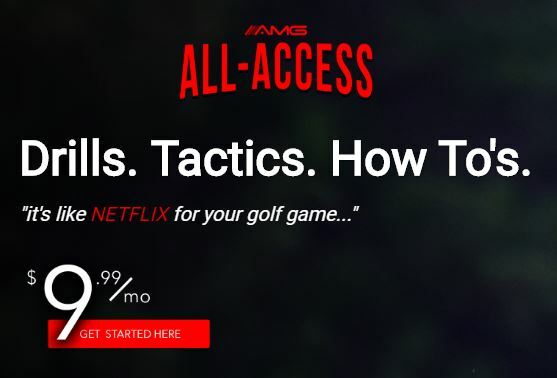 As an affiliate of Athletic Motion Golf (AMG) I am very excited to announce that I will soon have my own “channel” of golf videos on AMG’s new golf video streaming service called, “ALL ACCESS.” This service will feature hundreds of videos designed to help you with your golf game. There will be drills, tips, detailed explanations about the golf swing, and much more by the AMG coaches, myself, and several other AMG affiliate coaches. Here’s the best part, this video streaming service is only $9.99/month for access to all the videos! Like Netflix, there are no contracts or long-term commitments, and it’s easy to cancel if it’s not for you. There are no ads or product sales, just a lot of high quality golf instruction videos from top coaches. New videos will constantly be added, so you’ll always have something new to watch. If you follow AMG on YouTube, then you already know their videos are detailed, easy to understand, and have helpful information. Now you’ll get their videos, plus mine, and other top coaches, in one place. You can save your favorites too! My channel will have dozens of videos with drills and games. My clients can use them as a quick reference after our coaching sessions. Not a PWG golf student? No problem, you can try these drills too! I’ll also have videos on training during the off season, trouble shots, short game, club fitting, and more. Our goal is to get as much information to golfers as we can!